Emphasis & beauty: More … or less? To emphasize something (an idea, a word, an image, a sensation, anything), should you add or remove? To make something more beautiful, do you need to add or remove? So this is a post about adding and removing. I come at this, naturally, from the perspective of a writer. And as you might remember from my post about “color in writing,” I like to use art as an analogy for writing. Of course, I could also use sound, or smell, or touch or taste — but that is harder to do on a blog. So let’s think about words as visual stimuli. Look at those two temple scenes above (both from Wikipedia). I’ve been to both temples. Both are Buddhist. One is in Kyoto, Japan, the other in Chiang Mai, Thailand. Both cities are among the most beautiful I’ve ever seen. All of that is beside the point. If you’re like me, you will immediately focus your glance on one object: the pile of sand (or was it pebbles?) in front of the Kyoto temple. You will then scan the Thai temple for something to focus on … and give up, returning to the pile of sand. Which style, the Zen or the Thai, is better at emphasis? The Zen, of course. And it does that by removing details, the better to show one stunning detail. The Thai style, by contrast, is not interested in emphasis. It is interested in sensual barrage. the Thai experience leaves you stimulated. Is one “better” than the other? That’s not a fair question. But life isn’t fair, so I will answer it. The Zen aesthetic is superior. 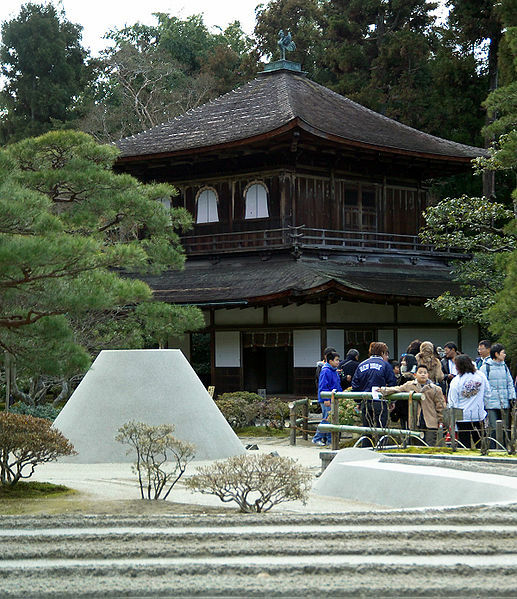 Now, let’s say you are a designer of temples (= writer). You better know at the outset which experience you’re trying to create. If you’re trying to make people serene, you better not incorporate any “advice” from the Thai guys; if you’re trying to stimulate, don’t listen to the Japanese. Put differently: author, know thyself. Let’s take another example. 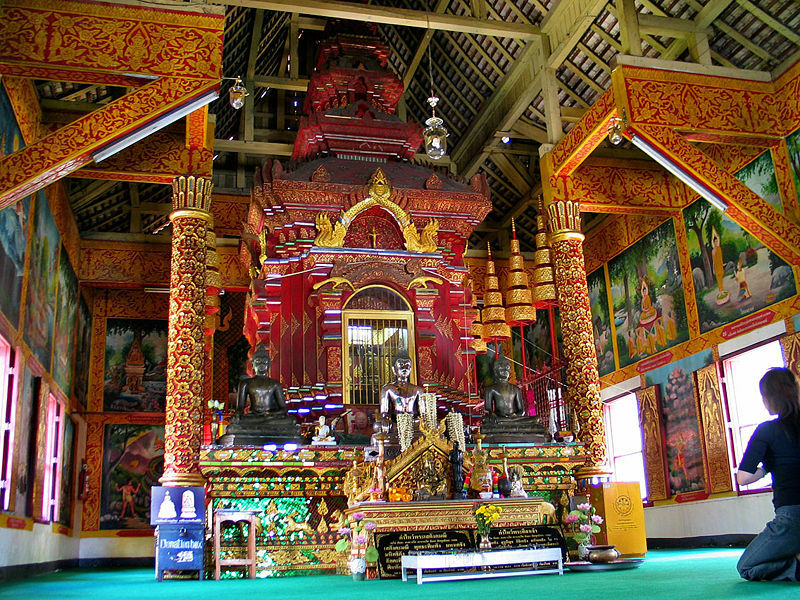 The caricature of Baroque and Rococo art is that they are overly ornate — Thai, rather than Zen, if you will. Do you see the wound of Jesus on the ceiling? Do you see the wound of Jesus? Of course you do. You see nothing else. Which is “better”? Again, it is not a fair question, and let me answer it anyway. The Caravaggio is better. It is superb, in fact, one of the best paintings in art history. 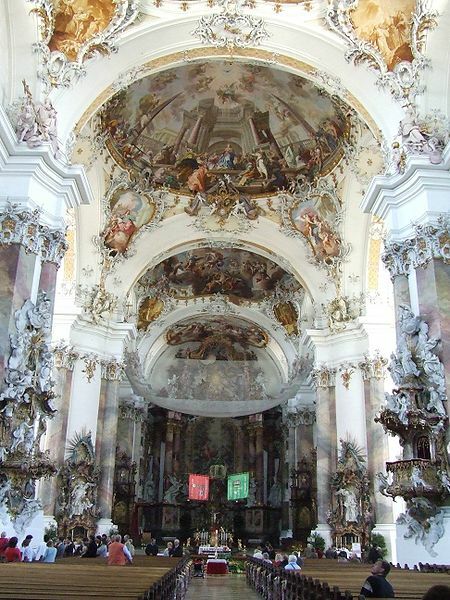 Ottobeuren is kitsch (which doesn’t prevent hordes of American tourists from visiting it). The purpose of Ottobeuren is to overwhelm you when you come in. 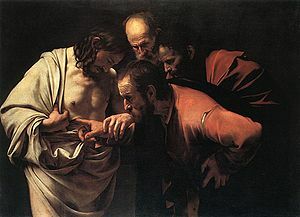 Caravaggio’s purpose is to focus your attention on one action — with light, detail and gaze (ie, that of the disciples) all subservient to that purpose — so that you contemplate a story around that action. What would Caravaggio have done if his patron had asked him to put, oh, a little angel or curlicue in the upper right hand corner, to “make better use of that space”? Caravaggio would have ignored him. Let me sign off on this little meditation with the famous spoof of Microsoft “improving” Apple’s iPod packaging. As you watch and smirk, think of your Powerpoint presentation, your corporate memo, your essay, your book or whatever: Are you going to commit, with courage, to the point you want to make? Well, then cut the crap. Get Zen. Put the finger in it. A brief meditation on: length in writing, which is to say word count. As a writer I am intensely aware of word count, throughout the entire process, even while I am still conceptualizing my story idea. What would be the natural length of this idea? What new idea would I have to add, or how would I have to expand the idea, to justify more word count? Could I deliver the same idea in fewer words? A note, which is a regular piece in a section, = 600 or 700 words. A column–such as Lexington (US), Charlemagne (Europe), Banyan (Asia), Bagehot (Britain), Face Value (Business), Economics Focus (Finance), or Obituary–is a few words short of 1,000. 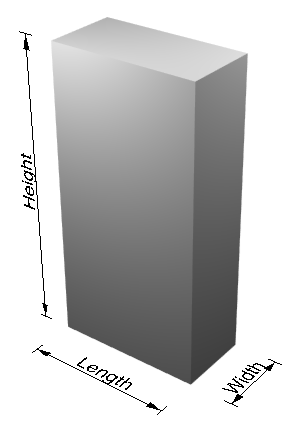 A box, ie a short and quirky sidebar, = 300 or 500. And so on. I have learned to like writing for prescribed word counts. It is great discipline. For example: When I write Face Values, I write 990 words, then cut six words to leave my piece one line short. Why? Because that way an editor can’t take anything out without putting it back in! 😉 It’s also my way of winking at my editor, and they, tending to be cavaliers, usually get it and wink back. Even in these sloppy blog posts, I always look at the word count, out of interest. Did you know that the average blog post, and possibly also the ideal blog post, is about 250 words? That’s just about what our boxes are at The Economist. My average is above that, but that is beside the point. The point is that…. I heard Bill say this when he was leaving The Economist and giving farewell interviews, in which he was explaining what was special about The Economist. Brevity, for one thing. Of course I know where that reaching for length on the part of writers comes from. All my students (when I taught at a Journalism School) always wanted to write long pieces. There is more kudos in it. You don’t get awards for 300-word pieces. Well, that is a scandal. You should get awards for 300-word pieces, and even for shorter pieces. Haikus! Limericks! Sonnets! I’m sorry I didn’t have time to write you a shorter letter. by which he meant that I should write and then find the phrases in my writing that I was most proud of (!) and just … cut them! For the heck of it. To prove to myself that I can. To stay humble and nimble. That phrase was my screen saver for three years. Easy. I visualize the figure inside, then I cut away the rest. A lot of art goes wrong because the artist does not dare to do that. This is when a great and riveting Hollywood movie suddenly becomes unbearable — because instead of ending when it should, it goes on for another twenty minutes of moral summary and closure (in a courtroom, probably) just in case you didn’t get it. Michelangelo only cut marble fat, not marble flesh, of course. Over-cutting is just as bad as over-writing. This has also happened to me. Sometimes, I write something that demands space and expansion, but then news happens and our layout changes at the last minute and an editor has to cut my piece to fit. This can go wrong. Perhaps the piece was subtly humorous or ironic, and now the tiny signals and implied winks are missing and it falls flat. Or a logical connector gets cut and the piece seems like a non sequitur. Or something went from being simplified to oversimplified and is just plain wrong. Or a writer might simply have a great subject that, by nature, wants to go on and be told as a story but instead dies a premature death. But I’ve observed that writers overwhelmingly err to one side: they overwrite; they rarely overcut. And they suffer more when an editor cuts than when an editor asks for more. Even though, to improve, they should always consider both options, simultaneously. All of this is simply to say: Every story, every thought, every joke, every movie, every poem has a natural (=optimal) length. A lot of good writing is simply intuiting that length and then writing to it, and not one word more or less. Unless you want to wink at your editor and leave it one line short. I think this is probably my favorite Rembrandt. More than that: it is a lesson! What makes this painting so good is the same thing that makes good writing good. It is the sparing use of color and light. For two years, I taught at Berkeley’s journalism school (thanks to Orville Schell, the then-dean, who invited me). That was the first time that I had to think about (ie, analyze, intellectualize, verbalize) writing, as opposed to just doing it for a living. And one thing that struck me is that all my students, and quite a few of the teachers there, grotesquely overdid that thing writers call “color”. On a bright, sunny day, John Smith was striding into his corner office, with a view of the Hudson and pictures of his three sons (Jimmy, 12, Billy, 14, and Bobby, 18) on his desk, next to a pile of Wall Street Journals and a cup of Starbucks soy latte. “I love this view,” said Smith. The Fortune 500 executive then turned…..
How many New Yorker articles have you read that started with some variation of ‘On a recent Sunday afternoon…’ or “It was a dark, overcast day when John….”, only to discover on the third of the article’s fifteen pages that these details would almost certainly prove to be of no help whatsoever? So there I was at the J-School, getting paid to read piece after piece by bright-eyed young journalism students who were so eager to prove that they had been there (wherever there happened to be), that they had actually interviewed some guy, that they had got the color, that they were ready for the New Yorker. It got extremely tedious. Am I against colorful writing? You must be mad. Of course not. I love color. By the standards of The Economist, I am a “color” guy. No child has ever said to his parents, ‘mommy, I want to grow up and write really monochrome stories’. If you have ever felt the impulse to try your luck as a writer, it was because you loved color, whether or not you called it that yet. The problem is that color without substance is just a paint bucket that tipped over. I’m not even talking about Rembrandt versus, say, Jackson Pollock. I’m talking about Pollock’s studio floor before he cleaned it up. Color has to be in support of something. And that something has to be an idea, a thought, a story. The mistake many writers make is to list details. Lists are boring; we use them to go shopping. Details are boring, unless they illuminate some meaning. It does not have to be epic. It can be quirky, amusing, moving, insightful, whatever. But there has to be a there there. So the trick is to find substance, and then to take away details so that only a few splashes of light and color remain, which then filter out the entire sensual world around the reader and deliver him to that one place that you, the writer, have in mind for him. In terms of thought process, it may be the opposite of what my students were doing, and what I used to do. I can find no better illustration than Rembrandt, above. You are drawn deep into this man. If I asked you, you would say that there is so much color in this painting, so much light. Only then would you notice that most of the canvas is dark, that very little of it is … in color. I popped into the Frida Kahlo exhibition currently at the San Francisco MOMA. Mainly, to see her piercing paintings–and boy, do they pierce–but also, at least in part, as research for my book. A friend of ours, Erika Lessey Chen, had suggested Kahlo to me a year ago as a possible life-story to look into. I had told Erika that I’m interested in people whose success (triumph) somehow turned into failure (disaster), or whose failure somehow turned into success, à la Kipling’s impostors. Does Kahlo fit my story-line? Mostly, I’m looking at characters such as Hannibal’s enemy and nemesis Scipio to illustrate how disaster at the right moment in a life can liberate a person–set free his or her imagination and creativity, and thus initiate a much bigger triumph in the future. People such as J.K. Rowling and Steve Jobs. But disaster can have other effects, of course. There is the strength that comes from overcoming it. I’ve mentioned Joe Biden and Demosthenes in that context. Among the main characters in my book, the person who would personify that is Fabius, the old Roman senator who was the only one not to despair after Hannibal’s crushing victories. And Kahlo? As I walked through the exhibition and looked at her absolutely harrowing self-portraits, I realized that she had done something else again with her own disasters: She had made the disasters themselves the success. Here she was on a hospital bed in Detroit, her body writhing and bleeding, with a uterus and a fetus torn out of her. She painted it after yet another miscarriage. The people in the exhibition became very quiet in front of that one. There she was bound in a steel corset with a broken spinal column, her entire body pierced with nails. In this painting, she is all pain and frustrated sexual desire. What were her disasters? The first was polio, which she caught at age six, and which left her right leg atrophied. The second was a bus accident when she was eighteen. She broke her spine, her pelvis, and lots of other bones, and an iron handrail pierced her uterus, leaving her infertile. 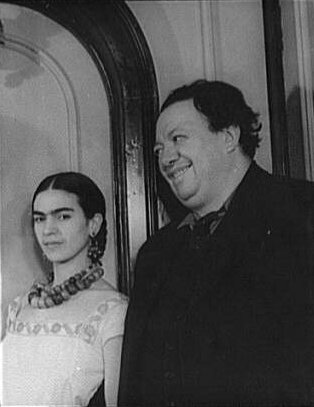 The third, arguably, was falling in love with Diego Rivera, whom she adored but who was never faithful to her. In short: pain, infertility, loneliness. And to deal with it, she painted. And the painting made her into the most “successful” Mexican artist ever.